A decade ago, after a speculative coal boom fizzled, the once-thriving desert city of Ordos, in Inner Mongolia, became China’s largest ghost town, littered with unfinished or empty buildings and desperate for another way to make money. Blessed like most of China with cheap labor, land, and, most important, cheap electricity, Ordos threw open its doors to all-comers, including bitcoin, the stateless digital currency whose total market value has more than quadrupled this year to $70 billion, and whose ability to act as a kind of digital gold has captured the imaginations of governments, big banks, and small entrepreneurs. Today, Ordos (population 2 million) has emerged as a center of bitcoin mining, the process of approving transactions and creating new coins in the digital currency’s system. Over half the world’s major bitcoin mining pools—groups of miners who agree to add up their resources to improve their odds of finding bitcoin—are located in China, according to a research paper (pdf, p. 91) by the Cambridge Centre for Alternative Finance. That has made China a dominant force in a new industry that may one day define how global transactions are ordered. Located in a decaying industrial park on the outskirts of town, the mine employs about 50 and consists of eight single-story, warehouse-like buildings, each 150 meters (492 feet) long. Seven of them host 21,000 machines that, together, represent nearly 4% of the processing power in the global bitcoin network. The other hosts 4,000 machines dedicated to litecoin, an alternative digital currency that’s been rising in price in recent months. Next to the warehouse buildings sits a three-story office with a canteen and dormitory for the mine’s workers. Racks of litecoin mining machines in a warehouse building in Ordos. This month, Quartz took a tour of the mine and spoke with its employees. Working in such a place can be both tedious and surreal. But the work is less physically demanding—and the clean, temperature-controlled environment is less hazardous to workers’ health—than at many jobs in the area, where the economy is driven by coal mining and industries like aluminum smelting and chemical engineering. China’s largest open-pit coal mine, Haerwusu, lies about 125 miles (200 km) from the industrial park. In 2012, before coal prices began to plummet, Ordos accounted for a fifth of the country’s coal output. While many local coal mines closed after prices dropped, the area remains notable for cheap, abundant, coal-powered energy, which helps explain the presence of a sprawling, electricity-hungry bitcoin operation in what feels like the middle of nowhere. The mine is run by a subsidiary of Beijing Bitmain Technologies, based, as the name suggests, in China’s capital, about 400 miles (644 km) to the east. In 2015, Bitmain took over the mine from its previous owner, who launched the operation in 2014. Bitmain claims that it is the world’s oldest large-scale bitcoin mine. In addition to running mines, Bitmain makes the machines—basically single processors in small, connected boxes—that mine for bitcoin. The company also operates Antpool, the world’s largest mining pool. The 50 Ordos residents who work at the mine are mostly in their twenties and they tend to the machines that generate cryptocurrency for clients. Few have expertise in bitcoin, but many have invested in cryptocurrencies nevertheless. Workers at the Bitmain mine prepare to put mining machines on shelves. It’s “just a gamble,” says Han Lei, 28, who’s been looking after the machines since the mine opened. Han has invested around 20,000 yuan ($2,987) in litecoin and other digital currencies but has avoided bitcoin itself because he thinks the price, currently at around $4,000, is too high. “After all, I don’t understand [bitcoin],” he says, adding he also has little time to check on fluctuating prices. 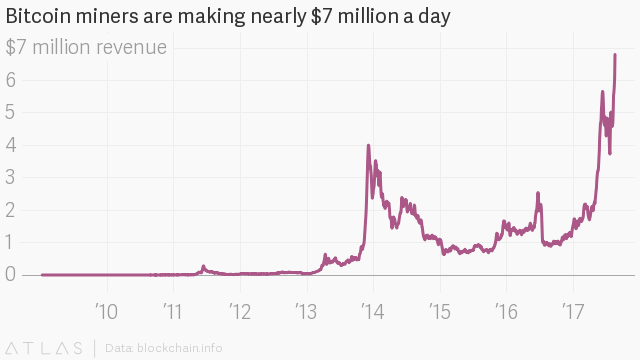 In the bitcoin economy, time really is money. Every 10 minutes or so, mining machines compete with each other to solve a math problem to win 12.5 bitcoins, a reward set by the bitcoin software. The work is akin to trying out billions of combinations of numbers on a safe. The miner who gets the right combination the fastest unlocks the safe. The more machines you have, the greater your chances of earning coins. With that in mind, miners try to ensure that every single one of their machines is operating properly, 24 hours a day, seven days a week, 365 days a year. Hence, the most important jobs are in the “operations and maintenance” department, where Han and Hou work, along with about 20 others. All day and night, using laptops, they monitor the status of the machines, and go into “the field”—the eight buildings that house them—to check on malfunctioning ones. A maintenence worker at Bitmain monitors bitcoin mining machines. Each building is surrounded by two fine-wire mesh fences. They are designed to keep out the dust of Inner Mongolia, which can, and often does, cause the machines to break down. Layers of dust can infiltrate the machines, causing them to overheat. The machines are already running nonstop at maximum output, so even a small increase in temperature can affect their performance. In the spring, the fences also guard against a flurry of fuzzy, bullet-sized catkins, shed by the willow trees common across China. “These are very delicate machines, so we have to take a lot of precautionary measures,” said Yu Linjia, who oversees all mining operations at Bitmain. Entering the mine from the Inner Mongolian summer heat, which often exceeds 30°C (86°F), is a relief. The temperature inside the warehouses is kept between 15-25°C (59-77°F). The dimly lit interiors are bathed in an alien glow from the machines’ green LEDs. The noise—a constant drone from the small fans attached to each machine, as well as the huge fans built into the walls of the building—is loud and unceasing. Employees must wear ear mufflers to do their work. If they’re lucky, maintenance workers can fix a machine by simply restarting it or reconnecting its cables. If not, they must take it off the shelf and hand it over to the repair department, which consists of six employees who work in the office building. Repair workers at the Bitmain mine in Ordos. Machines at the mine break all the time, given there are 25,000 devices. It’s a game of whack-a-mole: After one is fixed, another broken machine crops up. “I just try my best to check as many as possible,” said Hou, who tends to the machines daily from 8:30am to 6:30pm. Hou said it sometimes takes him a full day to go through just one of the seven buildings dedicated to bitcoin mining. Each has about 50 rows of shelves, and each row has 60 machines. In a given building on a given day, on average just over 10 machines will break, according to Han. The number more than doubles in especially hot weather because the machines overheat just like most computers, despite internal temperature controls. In mid-July, the temperature in Ordos once reached 36°C (97°F). Han said “there was no way” of keeping up with the malfunctioning machines at that time. Hou Jie, 24, is a maintenance worker at the mine. He shares this dorm room onsite with seven other employees. The work, though not physically taxing, can be all-consuming. Since he joined the company in late July, Hou has not yet been home, which for him is in Ordos’s main urban district of Dongsheng, 43 miles (70 km) south of the industrial park. He shares a dorm room on the second floor of the office building with seven colleagues, most of whom, like him, are unmarried. After work, Hou usually plays basketball with his colleagues, which he describes as the only recreational activity available. The court, if it can be called that, sits between two buildings and lacks boundary lines. It’s a dusty, makeshift space, on unfinished concrete with a single hoop. Behind the hoop is a shed containing a transformer for the mine. To either side are the low-slung factory buildings, one of them containing the litecoin mine, and the other, inactive. Around 5pm in the evening when we visited, a band of three or four workers were shooting hoops. Once he finishes his three-month probation period, Hou will have to work the night shift four to five days each month, as do his fellow maintenance workers. The workers don’t get fixed weekends off, and must apply to take time off a week in advance. Hou is planning “a long leave”—lasting two days—to meet his parents and help them with farm work. The mining farm is an outlier in the industrial park, which is full of unfinished buildings abandoned by developers after coal prices fell and the local property market crashed. Ordos accounted for a fifth of the country’s coal output at its peak in 2012, but many local private mines had shut down by 2014, when prices fell to six-year lows. Amid an economic slowdown, China’s benchmark steam coal prices halved (pdf, p. 2) between 2012 and 2016. China’s largest open-pit coal mine, Haerwusu, continues to operate. The firms that use the park tend to be chemical plants that emit high levels of pollution and emissions, according to Bitmain. The local government which oversees the industrial park declined a request for comment for this story. A janitor at the Bitmain mine mops the shelves hosting bitcoin mining machines. 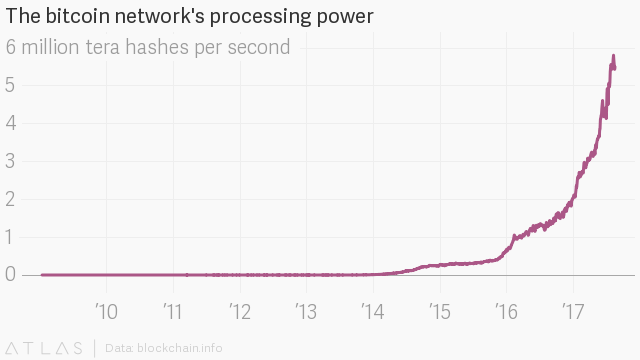 The bitcoin mine and the industrial firms have one thing in common: They use a lot of electricity. The local government has attracted Bitmain and several “cloud services” companies to the park by offering them a 30% discount on the electricity price, said Su Jiahai, who deals with local governments to build mining farms for Bitmain. The mining farm uses 40 megawatts of electricity per hour, about equivalent to the amount used by 12,000 homes during the same period. It pays roughly $39,000 a day for its electricity bill, even with the discount. The electricity in Ordos mostly comes from nearby coal-fired power plants, which provide a stable and constant source of electricity—although at a price to the environment. China’s less-developed regions, like the autonomous region of Xinjiang in the far west, or the Yunnan and Sichuan provinces, have lately become popular with bitcoin miners. Xinjiang’s electricity also comes mostly from coal-powered plants, while Yunnan and Sichuan offer cheap and renewable energy from hydroelectric dams. Bitcoin miners, though they profit from the virtual world, can no more escape the materiality of their vocations than gold miners. The bitcoin mines that rely on cheap hydroelectricity must disrupt their operations in the winter, when waters ice up and there’s less precipitation. They pack up their entire operations, load them onto trucks, and, after an arduous drive, reassemble them elsewhere. That usually ends up being Inner Mongolia because of its stable source of coal-powered electricity, said Liu Tao, a Bitmain executive in charge of mining operations. Bitmain operates other mines in Yunan and Sichuan. It recently finished building a new facility in northern Xinjiang—which it claims will be China’s largest data center of any sort—that is three times larger than the Ordos mine. This winter, the company will transfer mining machines currently based in Yunan and Sichuan to the Xinjaing facility, Yu said. Workers enjoy their dinner in the onsite dining hall. Jia declined to reveal his income because he said Bitmain bans him from doing so. One worker, though, said that his basic monthly salary is at around 4,000 yuan ($600), which is more than double the minimum wage for the Inner Mongolian region. The head of the bitcoin mine is Wang Wei, 36. Before joining Bitmain last year, he struggled as an entrepreneur. In 2011, he began to sell local coal to firms based in coastal cities, and then founded an interior design firm to serve the needs of the then-booming property market in Ordos. He switched to the hospitality industry after a struggling hotel client, unable to pay for the design services his firm had provided, gave him the entire hotel by way of compensation. That business failed, however, and Wang spent three years working as a mid-level manager at a ceramic-tiles factory in the industrial park. As for Jia, he seemed to have only one complaint: A nearby pharmacy factory emits noxious gases that often get into the mining farm. “I have irritation in my nose once the night comes,” he said.